Bedtime is negotiable! Milk and cookies for breakfast! This is a must wall decal for the home of any proud grandparent whose vocabulary doesn’t include “No”. 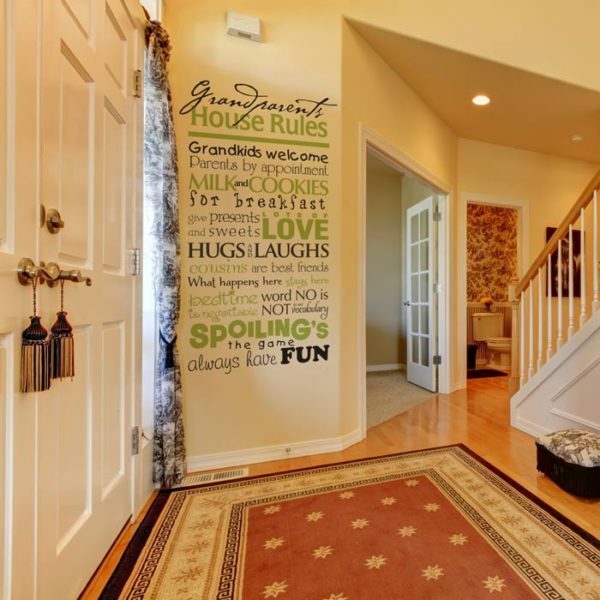 The Grandparents House Rules decal comes in custom sizes and in single-color or 2-color combinations. Kids and grandparents have a great connection! While they enjoy each other’s company and have loads of fun, the kids do need to know how to behave. Grandpa and Grandma will be delighted to have them over, anytime!. 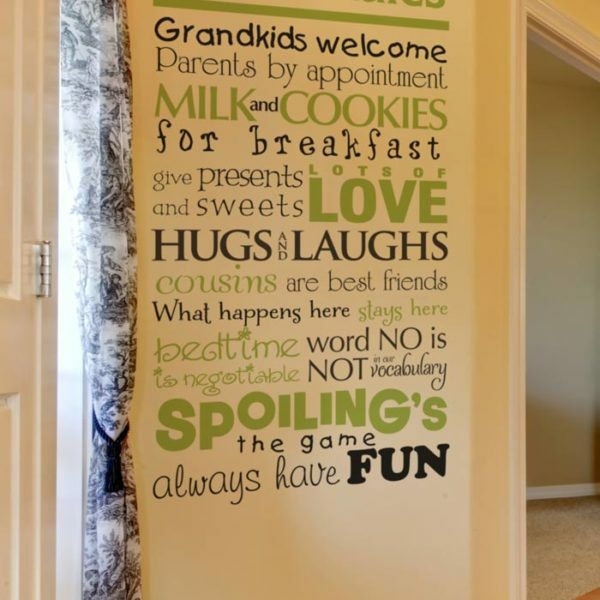 To make sure that the kids don’t drive their grandparents up the wall when they visit, we have ‘Grandparents House Rules’ wall words. The appropriate location, the entry way. 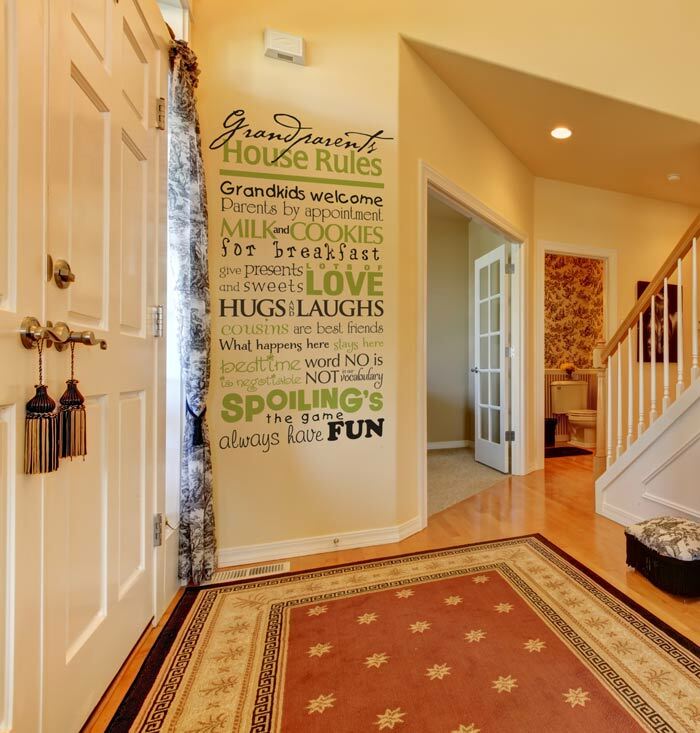 The wall letters tie in well with the carpet and staircase. The recessed lights give it a nice look. There is no glare because the wall letters are matte. This makes it easy to read and see. 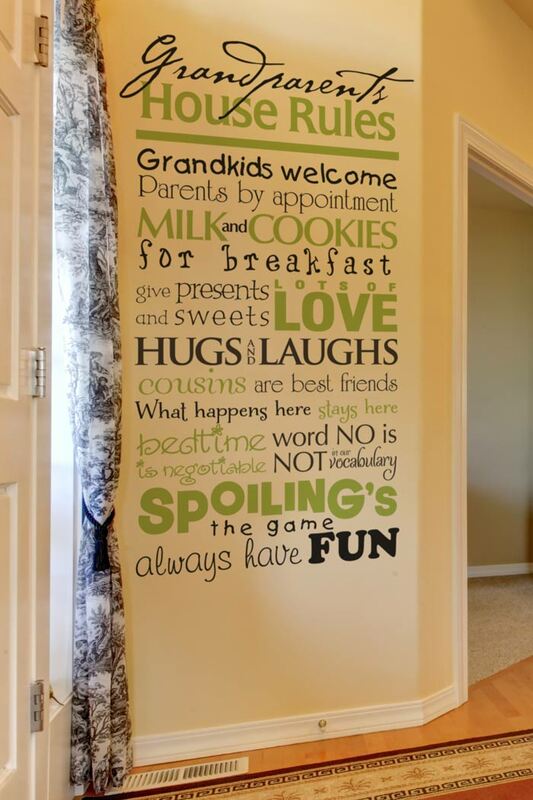 They not only look great on the wall, but they’ll make sure that the kids know how to behave while at their grandparent’s place. Looking for a wonderful way to make your grandchildren’s visit a joy? Try DecorativeLettering products. They are a great investment. For starters, they look hand painted and will last a long time. Our wall words are made from resin and can, therefore, withstand cold and high temperatures. We also have a great customer awards program. If you sign up for it, you get to earn points with every purchase. If you refer us to a friend, you will earn more points. Your pals will also get 10% off on their first purchase. Now that is a good deal! Do call or email: we’d love to help you create happy memories!